Squash Cranberry Muffins are perfect for Fall. My kids loved them! The other day I roasted a kabocha squash. I was going to use it in my Quinoa and Brussel Sprouts dish, but I ended up roasting it too long and it turned to mush. So I pureed it and decided to use it in these Squash Cranberry Muffins. My picky kids loved them! They are super easy to make. Vegan and gluten free. I used part sorghum flour for these since I was out of oat flour. Feel free to use gluten free oat flour as well. If you enjoy this recipe, you may also enjoy my gluten free butternut squash bread or my pumpkin chocolate chip muffins. I am still trying to use up all the food in my fridge and that is why I added cranberries and also chocolate chips. You can really add in anything you like. I know it’s hard to find cranberries that are not sweetened with sugar. Well I found some at Natural Grocers that were apple sweetened. I believe Eden Foods also sweetens their cranberries with fruit. 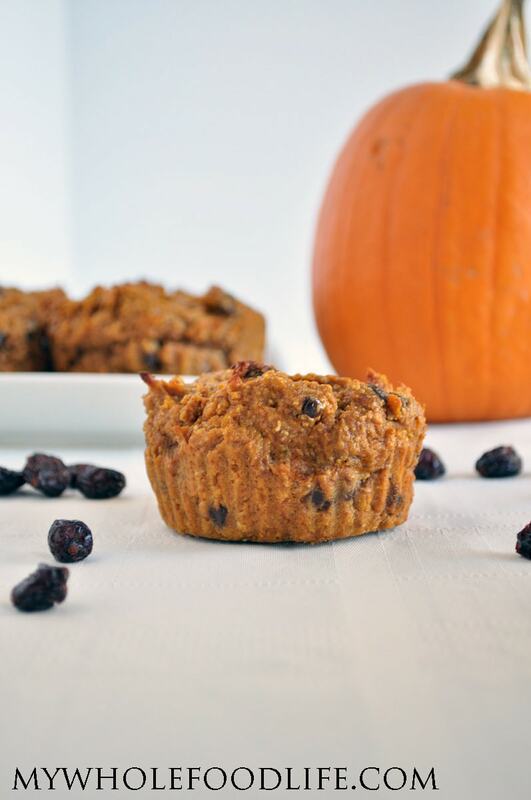 The flavors of cranberries and squash go perfect in these healthy muffins! I used a jumbo muffin pan with silicone liners . They should last a couple weeks. You can also freeze them for longer storage. **I made jumbo muffins and cooked mine for about 20-25 minutes. If you choose to make standard muffins, you will need to adjust the cooking time accordingly. I am guessing they will only need about 12-15 minutes to cook. Enjoy! Could I use sweet potato instead of squash? Yes I think that will work too. I'm wondering how these would do if I use raw cranberries? I've got a good stock of Alaska cranberries in my freezer. They aren't sweet, not at all, and quite petite. Do you think I'd be able to use undried, raw cranberries in these. I have a nice stock of frozen wild lowbush cranberries in my freezer that I'd prefer to use. Alaska cranberries are not sweet, rather they are very tart, so I would definitely do this with the chocolate chips for a sweet - tart balance.